The LV200 has been carefully designed for long-duration cell bioluminescence. A completely new optical design dramatically increases sensitivity and enables the detailed study of photosensitive cells and luminescence probes at high magnification. The built-in system for temperature control, humidity and gas flow helps to keep the cultured cells or tissue slices in a healthy condition throughout the observation period and the unique light-tight enclosure shields the sample and optics from any external light. Luminescence comes from within the sample and is in turn non-toxic to the cells. There is also no background noise or autofluorescence to worry about. Luminescence is, therefore, the right light for live cell imaging. Luminescence has several potential benefits over fluorescence including better signal-to-background ratios due to the lack of background emission and no phototoxicity nor photobleaching, making it ideal for quantitatively following long-term changes in live cell systems. The observation of luminescence has previously been held back by a number of technical challenges. In the LUMINOVIEW LV200, Olympus has successfully developed a luminescence microscope system that overcomes these challenges and harnesses the power of bioluminescence imaging for the first time in a commercial system. Fluorescence microscope and related techniques have many advantages, but also a number of limitations. Bioluminescence imaging has the potential to overcome these limitations. 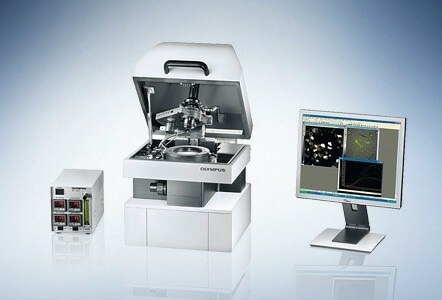 The unique optical design of the new Olympus LV200 brings together the advantages of fluorescence and bioluminescence to create a system capable of acquiring bright, high- resolution images. Fluorescent emissions tend to be short-lived and bright, requiring specific frequencies of light for excitation. As a result, this illumination is required at the time of imaging, which means that the optical system must be able to supply strong and fully controllable light at one wavelength and project the emitted light on a different wavelength to the user’s eyes and/or camera. Despite these relatively complex optical requirements, fluorescence techniques have flourished and are enabling groundbreaking discoveries in many research areas. Luminescence emissions tend to have varying lifetimes and are often quite faint, but due to the lack of background or fluorescence they can be measured with a high signal-to-noise (S/N) ratio. This makes luminescence ideal for applications where there is strong autofluorescence, such as whole animal imaging or in samples containing various compounds from chemical libraries. The in vivo imaging systems and microplate luminescence readers have shown great success in these areas. Bioluminescence imaging has great advantages over fluorescence imaging since it combines a high S/N ratio with no bleaching/phototoxic effects. What is more, only viable cells emit luminescence signals since emission is only possible with a functioning metabolism. As a result of this, bioluminescent measurements are ideal for sensitive living cells and are absolute and directly quantitative. These advantages are now no longer limited to macro imaging and bulk measurement, but can now also be applied to high-resolution microscopy. Olympus has developed the LV200 LUMINOVIEW bioluminescent imaging system, which provides amazingly detailed images using standard CCDs rather than specialized photon detectors. To do this, the optical design of the system is highly specialized to maximize light collection - an essential aspect, given the low levels of light emitted. The light path from the object to the camera is straight and as short as it can be to ensure that as much light as possible reaches the CCD chip. There is also no need for any additional mirrors, filters or lenses which absorb light, reducing the signal even further. Furthermore, the tube lens has been designed with an extremely high numerical aperture (NA), which affords a vast increase in sensitivity when compared to conventional microscope optics. As a result, the LV200 produces signal outputs many times higher than traditional systems and can, therefore, be used with conventional CCD or EM-CCD cameras. The LV200 can use different magnifications from 0.8x to 20x, enabling it to clearly image samples from large brain sections down to individual cells. These unique optical properties ensure exquisite single-cell resolution not previously possible with luminescence imaging. These improvements, along with the number of luminescent probes now available, promise to take microscope imaging to a different level. These properties also enable excellent spatial resolution, so that weak signals near areas with high signals can be differentiated with great ease, which is not possible on a luminometer.